Directed by Hall Bartlett / Written by Arthur Hailey, Hall Bartlett and John C. Champion / Starring Dana Andrews, Linda Darnell and Sterling Hayden. I’m just going to come out and say this; I didn’t really like Airplane! 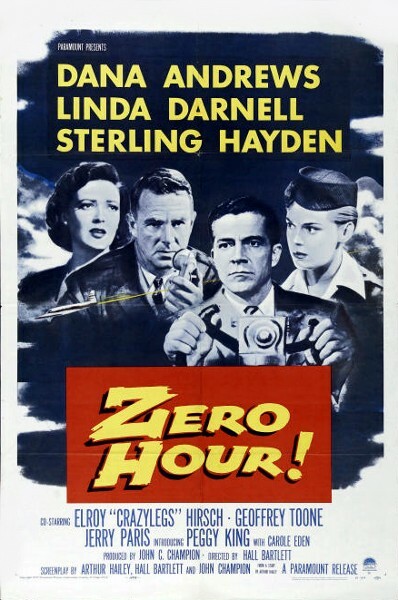 Although occasionally funny with its over-the-top nature, I found the film to be schlocky and unintelligent, which was a viewpoint I maintained up until I saw the movie that it is spoofing, Zero Hour! This film is overdramatic to the point of self parody with almost the exact same plot as Airplane! which in turn enriches both movies. Airplane! is funnier having seen where all of the jokes come from and Zero Hour! remains as an amusing piece of film history. Lt. Ted Stryker (Dana Andrews) is a Veteran pilot who on his last mission as a squadron leader, made a snap decision that cost the lives of six of his men. Eleven years later, Stryker remains as brooding and anguished as ever due to the tragedy that he faced during the war. His wife Ellen is in the process of leaving him and attempts to take their son Joey with her to Vancouver, but Stryker follows them in order to try to mend the rift in his family. Disaster strikes when several people on the plane suffer from terrible food poisoning after having eaten contaminated fish, and with the pilot and co-pilot passed out from illness, Stryker must rise to the task and land the plane. Struggling to overcome his anxiety and depression about what happened the last time he operated an aircraft, Stryker, with the aid of those on the ground, keeps his son and wife in mind so that he can return everyone to safety. If this all sounds familiar, then congratulations, you’ve seen Airplane! Every character in this film is really not far off from their parody counterparts. Due to the fact that both movies are released by Paramount Pictures, the makers of Airplane! were able to use the predecessor’s script almost verbatim. Although the entirety of Zero Hour! is ridiculously overdramatic, Dana Andrews steals every moment on screen by being a caricature of a man with a torrent past, as with Robert Hays’ comedy portrayal in 1980. One of the funniest scenes by far is when little Joey Stryker visits the cockpit before everyone is stricken with illness. Parodied in Airplane! with the pilot being inexplicably perverted by asking the Joey character if he’s ever seen a grown man naked, one can see where the joke comes from in Zero Hour! The pilot gets uncomfortably close to the little boy, rubs his shoulders for far too long and asks him if he wants to be a pilot when he grows up. Zero Hour! is a hilarious and hyper-dramatic disaster story that is suiting to fans and despisers alike of Airplane! I recommend watching the two films as a double feature to spot the similarities, and not to worry the next time you board a plane, because it’s apparently prohibited for a pilot and co-pilot to eat the exact same meal just in case one of them is tainted. But just in case, you better pass on the fish. Zero Hour (1957) is available on DVD (Region 1) from Amazon.co.uk ; and if you decide to make a purchase after following this link you will have supported Attack From Planet B, so thank you.